In the last year Rachel Van Dyken has become one of my favorite authors. I have never read one of her books and walked away disappointed. It seems as though no matter what the story line I find myself laughing or crying and oftentimes with my mouth wide open in shock at the curve balls she always seems to throw and which I never see coming! 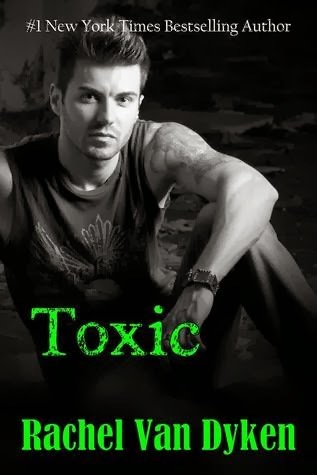 Once again all those emotions happened for me as I was reading her latest release, Toxic. I found Gabe's story to be amazing, and surprisingly very touching. However, before I go any further, let me say this, if you have not read Ruin by RVD, in my opinion you really need to take the time to read it first, it will only enhance your experience and love of Gabe having first met him in Ruin, which is the story of Wes (his best friend) and Kiersten. Toxic begins shortly after the end of Ruin. If you've read Ruin then you know Gabe is Lisa’s cousin and during the trial Wes faced they formed a really strong friendship. Even while reading Ruin Gabe's character intrigued me, so I couldn't wait to see where his story would lead us, and let me assure you RVD did not disappoint. Before starting Toxic I can honestly say I knew very little about Gabe, he always came across a little mysterious. The things I did know were specifics such as he loved Lisa and I could tell he was very protective of both her and Kiersten. He also seemed to love hooking up with women but never seemed interested making any kind of commitment. Gabe is very tight lipped about his life and family, and while he wants to be happy and open up to someone, he doesn’t know how to do it. By chance one day he runs (quite literally) into Saylor and can’t seem to get her off his mind. She triggers emotions in him he didn't think would ever be possible again and eventually their "relationship" forces him to open his heart, to trust people in a way he's never trusted them before and to deal with his past once and for all. The emotional awakening in Gabe is a beautiful journey, his story is heartbreaking yet so full of love and sacrifice. I don't think you'll even see it coming! Saylor is a very sheltered and innocent music major. She is a perfectionist but has trouble actually communicating feeling in her musical pieces. Even though they are played flawlessly, something is always missing. Perhaps it is because she has never experienced life changing emotion? I really love Saylor though. Her character seems to bring out the best in other people and she seamlessly clicked with the rest of the gang. One of my favorite things about this series are the friendships formed throughout the story and the books simply wouldn't be the same without those dynamics. As a side note, since mentioning things I enjoyed about this book, I have to say I also loved the pieces of Wes' wisdom at the beginning of some of the chapters. His life quotes are simply the best and always provoke some serious thinking! I don’t want to give too many details Toxic's story away because some things are just better experienced when you don't know what to expect, but suffice it to say Toxic is one of the best books I have read in a really long time. What will happen with Gabe? What secret is he hiding and when the truth comes out will it destroy all the relationships and friendships he has worked to build? This is a no brainer...one click both Toxic and Ruin today, their stories are the kind you shouldn't ever pass up.